This is not a wholly unusual conclusion for the series. In “Pony Exce$$,” director Thaddeus Matula explored the corruption and ultimate destruction of Southern Methodist University’s (SMU) then dominant football program as booster money flowed in from the oil wealth that defined the Southwest US in the 1980s. Though the Southwestern Conference consisted of eight schools (Baylor, Rice, SMU, Texas, Texas Tech, Texas A&M, Arkansas, and Texas Christian University), Dallas served as a hub for numerous successful graduates of each school. As several observers note in the documentary, football rivalries crackled in the board room meetings of Dallas high rises as alumni from all schools engaged in recruiting practices that seemed to define the decade. Likewise, Billy Corben’s film,“The U” about the dominance and bravado of Miami University’s 1980s football teams reflects similar themes. Miami’s football team served to unite a divided city behind a collection of local talent that also rewrote the rules of the game. Miami’s players excelled spectacularly on the field but stoked controversy with their trash talk and exuberance. If oil money shaped SMU, Miami’s notoriously tough African American neighborhoods, embraced by Miami’s first successful coach Howard Schnellenberger, came to symbolize “The U’s” power. Along with cultural productions like Scarface, Miami Vice and the notorious Two Live Crew, players like Michael Irvin challenged college football and its fans. Unlike “Pony Exce$$”, “The U” reveals the racial undertones that marked some of the criticism faced by the Miami program. When teamed with Steve James’ masterful “No Crossover: The Trial of Allen Iverson” and the recent “Fab Five” film about the innovative early 1990s Michigan basketball team, “The U” reveals so much more about American life than just college football. 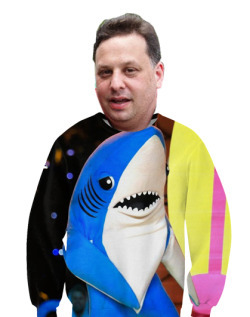 Race, money, and a changing cultural landscape collided. As one writer observed, James’ movie looks at Allen Iverson “more as a phenomenon, a human inkblot whose polarizing effect on people often says more about them than it does about him. They see whatever they want to see, and that may or may not be the truth.” In essence, all these films and others in the 30 for 30 series function to elevate sports to a level of political and social importance that might have been derided in early decades. 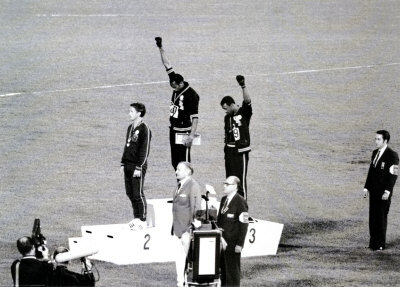 For Americans, sports provided both meaningless entertainment and incredible important cultural moments of resistance. Dave Zirin documents athlete resistance of the twentieth century in his 2005 work, What’s My Name, Fool? Sports and Resistance in the United States. To Zirin’s credit, What’s My Name, Fool? gathers countless examples of political acts by athletes across the sports spectrum, engaging in issues of race, gender, and class. For example, Zirin traces the complicated politics of Jackie Robinson who, despite his bravery in desegregating MLB, came to be unfairly seen by radical Black nationalists of the late 1960s as a sell out. Some have described Zirin as sort of Howard Zinn of spors journalism. Perhaps. He does look at major historical events like the 1968 Mexico City Olympic protest by Tommy Smith and John Carlos, in which both athletes upheld closed black gloved fists. Zirin explores many facets of the event that had gone unnoticed. Unfortunately, while Zirin collects valuable stories worth reflection, he too often veers in the direction of soap box oratory. Moreover, Zirin seems to feel the need to conclude paragraphs with zingers. For example, how about this gem regarding the failure of several WNBA sports franchises: “while some franchises found success, others have folded faster than a rib joint in Tel Aviv.” (186) When discussing Allen Iverson, Zirin notes Iverson’s role as an anti-corporate anti-hero summarizing his nickname may have been A.I. but “there was nothing artificial about him.” (163) Nuance is not the most prominent feature of What’s My Name, Fool. Still, even if the equivalent of street corner radical, Zirin contributes something to our knowledge of American culture and sport. A central aspect of Barca’s identity rests on its foundational myth, its role as a means of Catalan resistance toward the post Spanish Civil War fascist Franco regime. According to this myth, Camp Nou, Barca’s legendary stadium, enabled Catalan fans to express themselves in ways forbidden by Franco. Camp Nou allowed for political and social subversiveness. “Its fans like to brag that their stadium gave them a space to vent their outrage against the regime,” writes Foer. 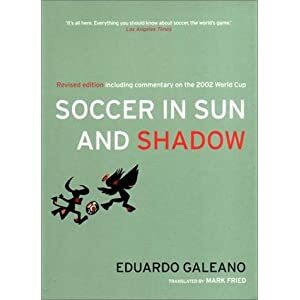 “Emboldened by 100,000 people chanting in unison, safety in numbers, fans seized the opportunity to scream things that could never be said, even furtively, on the street or in the café.” (204) Yet, as Foer acknowledges, there is another way to view Barca’s history. More likely, Franco saw Camp Nou and Barca as harmless outlets for his repressed populations. Unlike the Basque region and its terrorist/separatist movement ETA, Catalonia never developed any similar liberation fronts. 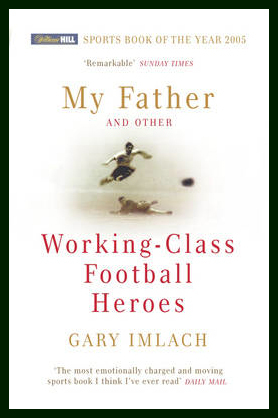 If one believes the authors of Soccernomics, the provincialism of the nation’s working class remains one of the maladies plaguing English football. Though the authors acknowledge England’s creeping post war “embourgeoisement”, working class attitudes continued to dominate footballing circles and not necessarily for the better. In America, football depends largely on the middle class, but in England, for much of its sporting history, working class culture produced the vast majority of players. 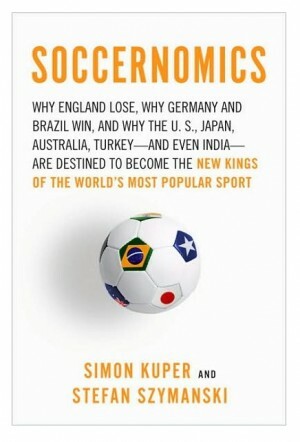 Soccernomics laments this development, suggesting the exclusion of the nation’s middle classes from competitive soccer acts as a “brake” on England’s international hopes. Furthermore, Simon Kuper and Stefan Szymanski argue that the provincial proletarian mindset continues to bedevil the sport. Pointing to the insights of Manchester United Manager Alex Ferguson as evidence, Britain’s working class players subscribe to a theory of work in which they are “entitled” to a couple pints every night (provided they’ve put in an honest day’s work), not to mention the semi-frequent Saturday night bender. Ferguson identifies this belief system as a direct result of “the shift worker’s mentality”. How very Scottish. The authors are not completely unkind. They point to long traditions of self education among working peoples, the rise in college attendance among the general British public, and the blame that the middle and upper classes deserve for the wayward educational opportunities of England’s proletariat, yet despite these examples “the anti-intellectual attitudes that the soccer administrators encountered do seem to be widespread in the English game,” write the authors, “These attitudes may help explain why English managers and English players are not known for thinking about soccer.”  For many players and managers, education serves as a mark of suspicion rather than achievement; Kuper and Szymanski label this the “anti-educational requirement.” While Soccernomics points to many truths about the game, it is not the rosetta stone of football. The book is sometimes guilty of ahistoricism (or at the very least flawed periodization that doesn’t always fully reveal all the nuances and turns of their subject’s narrative) and economic determinism (which some fairly point out should not be a surprise considering its title). The question is, how to get at these slippages? In 2000’s The Many Headed Hydra, historians Peter Linebaugh and Marcus Rediker explored the transnational revolutionary Atlantic world’s collection of working and enslaved peoples’ of the seventeenth and eighteenth centuries. Linebaugh and Rediker present numerous examples of this burgeoning Atlantic world proletariat as it struggled against the crushing dominance of a nascent capitalism shedding its mercantilist restraints. The commoditization of labor and peoples, left sailors, slaves, and commoners as physical representations of opposition, providing tangible fervor and ideological depth to various uprisings, revolts, and revolutions from England to the West Indies to the United States. Acting as “nodes of revolution”, sailors and slaves carried ideas, plots, and oppositional violence against “the dictates of mercantile and imperial authority” targeting the property of the growing merchant class. (156) In the face of state sponsored violence of the period ranging from slavery to penal colonies to military intervention, revolution through piracy, slave revolt, and riot served as resistance to the formation of new capitalist order. 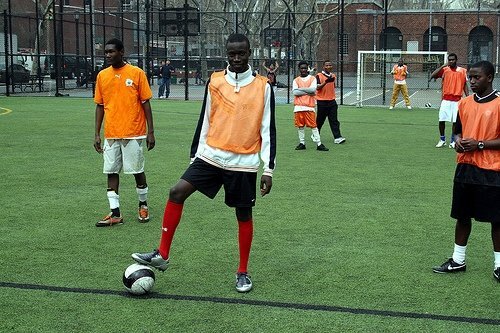 • Players themselves, most from working class populations (in the rich and developing world (though differences between poverty in France and South Africa remain stark), serving as nodes of both developments. On the surface, it appears that among the 4 remaining teams, Uruguay is the minnow, the surprise. No one really expected them to be playing today–some even doubted whether they would advance from their group, given that they were placed with two purported soccer powers in Mexico and France, as well as the host South African side. But from another perspective, this is a return to the sun for Uruguayan football, after decades spent in the shadows. Consider that of the remaining semifinalists, Holland and Spain have never won the World Cup (perhaps the two greatest footballing nations never to have won), and while Germany has won 3 times (as West Germany, actually: twice as hosts, in 1954 and 1974, and again in 1990), Uruguay is right behind them, having won twice, in 1930 and 1950. 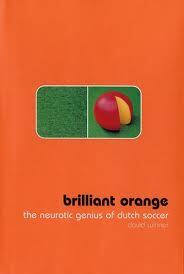 Today’s first quarterfinal match may just be the most anticipated of the bunch–Brazil vs. Holland. It’s a contest between two great footballing nations, both known over the decades for playing beautiful football–technically precise, individually and tactically creative, seemingly able to maintain possession as long as they want–and for producing some of the greatest players of all time. From Brazil: Ronaldo, Rivaldo, Ronaldinho, Roberto Carlos, Romario, Garrincha, and of course Pele. From the Netherlands: Ruud van Nistelroy, Denis Bergkamp, Frank Rijkaard, Marco van Basten, and the greatest and original Dutch master, Johan Cryuff. Where Brazil and Holland differ, of course, is in their records of World Cup success. Brazil has won the Cup five times, more than any other nation–in 1958, 1966, 1970 (those three with Pele on the squad), 1994, and 2002. By way of comparison, Italy has won four times, Germany three (twice as West Germany), Argentina and Uruguay twice each, and England and France once each. Conspicuously absent from that list is Holland. The Dutch have come close–twice in a row finishing in 2nd place, both times losing to the hosts: to West Germany in 1974 and to Argentina in 1978, and advancing to the semifinals in 1998, only to lose to Brazil in a penalty shootout.